Photo (approx 4.25 x 3.25 inches) mounted on a cardboard frame/backing (a bit less than 5.25 x 4 inches). Written on the back in pen is Obergymnasium Reichenberg. Written in pencil is something I can’t quite make out, but might be a name like Gunther or Geister or something. An Obergymnasium is basically a German upper level prep school, roughly equivalent in the U.S. to a high school. These are presumably, then, a group of the school’s students, and perhaps a faculty member or two (hard to tell). Since this is in German, I assumed Reichenberg was in Germany, and indeed there are two towns in Germany called Reichenberg (one small, and one tiny). But Reichenberg also turns out to be the old German name for the Czech city of Liberec, and I’m inclined to feel that that’s our most likely candidate. Not only are the simple odds in favor due to the city’s comparative size, but there’s the clue of the handwriting. Click here to see it. Note the caron over the letter “u”? (Yes, I had to look up the word “caron”.) That’s very Czech. That proves nothing of course, but it’s highly suggestive, I think. (And if anyone can decipher the word in pencil, please let me know.) Lastly, I had to mention that pose. I’ve seen it a number of times in group photos from that era. People arrange themselves in an ordinary grouping, but two people position themselves on the ground, head to head, to complete the picture, almost like a human understroke, even if it means lying on the dirt. The location of the photo seems a little unusual to me. I would expect the group to pose on the steps of their school or another more open, attractive spot rather than tucked in a cramped area between two buildings. I had the same thought. I thought hey were perhaps outside for the lighting, but it’s hard to believe there wasn’t a more picturesque location elsewhere. Those are some pretty coky young men. Mazel tov to them. Whole lives ahead and all that. Agreed. There’s enough attitude in those expressions that it makes me wonder if it’s really a formal class portrait, or something more like a club photo. It’s a little haunting to look at those faces with the benefit of hindsight and imagine what life presented them, but I’m sure people will look at pictures of us a hundred years from now and think the same thing. two and a half years late? I can confirm that your photo “Obergymnasium Reichenberg” relates to Reichenberg in Bohemia. My father and his brother (born 1906 and 1910) attended this school and subsequently studied in Prague. Reichenberg then had about 90% German inhabitants but some of the high school students came from the region with a still higher German percentage. The photo is not an official one which of course would have included the teachers. 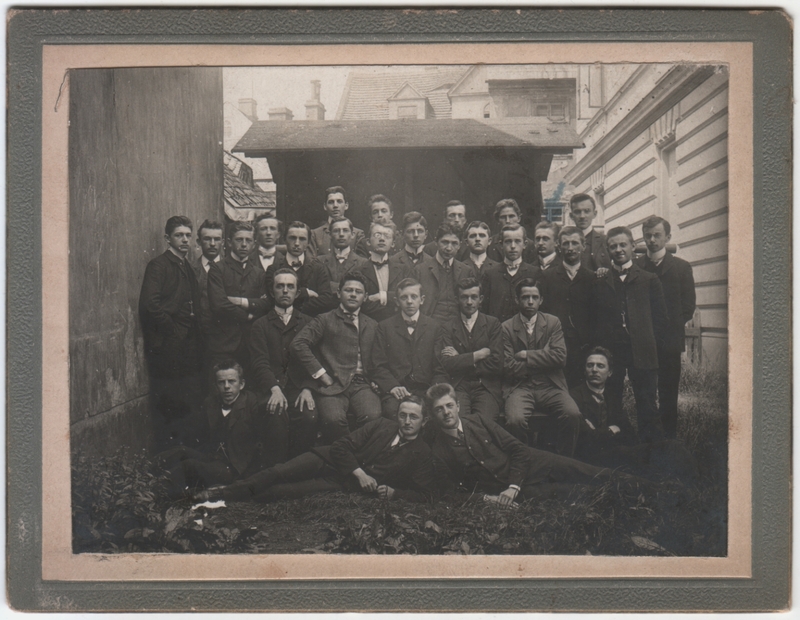 I think it was taken before 1918 since in Czechoslovkia it would have included female students. The pencil writing on the backside reads Geißler and the caron above the u is still today occasionally used in German hand writing to distinguish it from n.
In Reichenberg a Rudolf Heinrich Otto Geißler was born 16 Feb 1897, his father Joseph was a “comptoirist” (office Clerk), his grandfather an accountant. Have a look at http://www.usti-aussig.net/autori/karta/jmeno/53-rudolf-geissler ! This is the mentioned Rudolf Geißler who became an architect in Aussig (Usti nad labem) and married there 28 Dec 1926. That could very well be the case. It’s always interesting to examine these photos in their historical contexts. Mat, can you send me a scan with a higher resolution? I am busy in Reichenberg genealogy and maybe I can find out some more. My old scanner isn’t compatible with my new computer, which is why I haven’t been posting in a while, but I’ll see what I can find. for me it is amazing, since Rudolf GEISSLER seems do be the younger brother of one of my teachers in Eastern Germany. Thank you for all the information and research! It is amazing what information is out there, and how much can be discovered from just a few clues.